Come enjoy dinner before the concert. To view the menu, Click Here. David Pack’s Legends Live will join us at Boot Barn Hall at Bourbon Brothers March 15th and 16th. 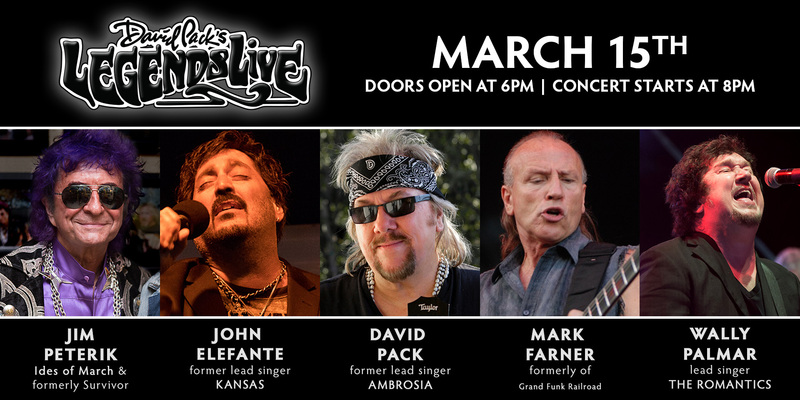 Legends Live features five legendary rock icons on one stage each night, singing their all-time classic hits with an all-star backing band. This will be a truly once-in-a-lifetime experience. These are the originators, the voices and writers who’ve collectively sold over 500 million albums, charted 25 Top-10 songs, and won dozens of Grammys. Their songs have stood the test of time, they remain in heavy radio rotation, and they have captured the hearts of a whole new generation! Come experience Legends Live, and make their music part of the soundtrack of your life!